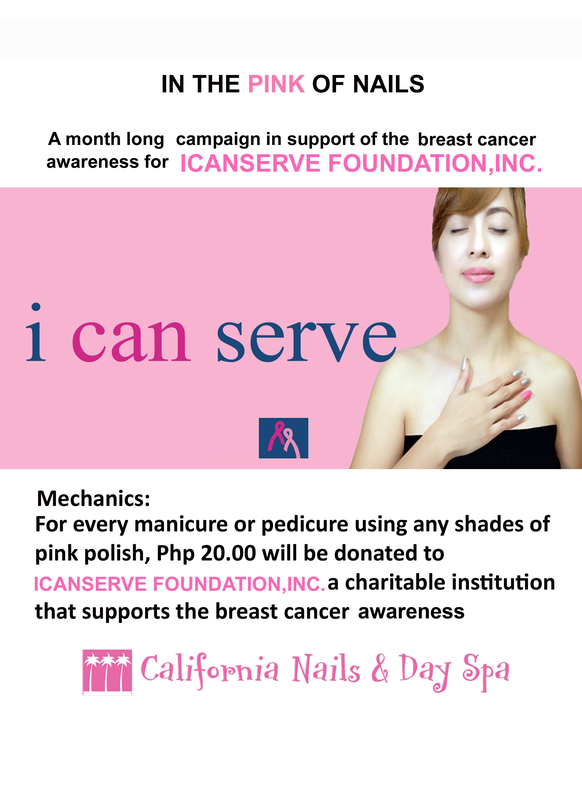 From October 1 up to November 10, 2016, California Nails & Day Spa will donate P20 for every manicure or pedicure using any shade of pink polish to I CAN SERVE Foundation. Find California Nails & Day Spa in Mall of Asia (Pasay), Greenhills Shoppesville (San Juan), Pergola Mall (BF Homes, Paranaque), SM Southmall (Las Pinas), Market! Market! (BGC), Vista Mall Taguig, Festival Supermall (Muntinlupa) and Evia Lifestyle Center (Las Pinas).